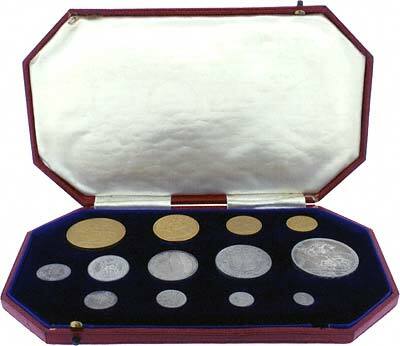 In 1826, during the reign of George IV, a proof or specimen set of coins was issued, containing one example of each of the current coins. This included all four gold coin types, five pound, two pound, sovereign, and half sovereign. The five pound and two pound coins were only issued as proofs, none were issued for circulation. The sets also contained silver and copper coins. Although proof coins had been issued during the reign of George III, these appear to have been produced individually, and we are not aware of any complete proof "set" earlier than 1826. Proof sets continued to be issued, on very special and infrequent occasions, from 1826 to 1953. Sometimes these included complete ranges of gold, silver and copper or bronze coins, other sets were issued containing only gold coins, only silver coins, or various combinations. Out of the thirteen different years in which proof sets were issued, only nine included gold coins. During the early years, coin collecting, especially proof sets, was restricted to only a very few, mainly wealthy, knowledgeable or influential individuals. Minor coins in copper or bronze were omitted from many early sets, they were not considered as important. In 1937, two separate sets were issued, one consisting of just the four gold coins, the other containing the silver and bronze coins. In the following years, no gold sets were issued until 1980. In advance of decimalisation in 1971, a department was created at the Royal Mint to produce, package and market coins for collectors, and in 1980, gold coin sets were once again issued, and this production has continued every year since. In some years both proof and ordinary versions have been produced, while in other years only one version has been made. The first modern gold set, issued in 1980, contained four coins, the five pounds, two pounds, sovereign, and half sovereign. All four of these coins respected tradition using the very fine and familiar portrayal of Saint George slaying the dragon, by Benedetto Pistrucci. This design, which was first used on medallion of George III, was used on the very first five pound coin in 1820, on the two pound coin of the same date, and on the modern sovereign and half sovereign first produced in 1817. The St. George design was also used on silver crowns from 1818. In many of the years following 1980, the contents of the gold coin sets have varied. In 1981, for example, just two gold coins, the five pound and sovereign were included, but the set extended to nine coins, down to bronze halfpenny. The gold set of 1983 omitted the five pound coin. That of 1984 omitted the two pound coin. In 1986, the two pound gold coin shared the commemorative design used on the new nickel-brass two pound, and the five pound coin was omitted. In 1989, another special design was produced and used on all four gold denominations, being a recreation of the original sovereign design of 1489, showing the monarch enthroned on the obverse, and the reverse design being a shield bearing the Royal Arms within a Tudor rose. From 1990, the crown, previously five shillings, was promoted to a face value of five pounds. The crown started life as a gold coin in 1544 under Henry VIII. In 1551, it became a silver coin, and so it remained until 1951, when like the rest of our "silver" coins, it was issued in cupro-nickel. With the 1990 issue, much of its history was consolidated in many ways, in retaining its old five shilling size, and being issued in cupro-nickel, sterling silver and 22 carat gold. Although a "five pound crown" was in one sense a new denomination, its issue in gold reconfirmed its origins. Conveniently, although the diameter of gold five pound crowns is slightly larger than that of gold "quintuple sovereigns", they both retain the previous weight of the traditional five pound pieces. You may wish to visit our £5 Gold Information page, or our £5 Gold For Sale page. We tell the story of £2 coins on our "Two Pounds Information" page. 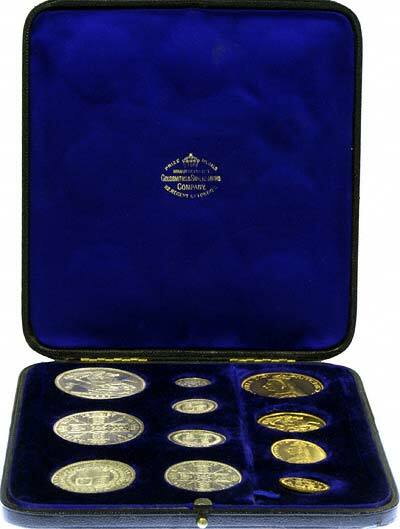 We list the British gold sets we have for sale on our Gold Coin Sets For Sale page. 3 Coin Gold Sets For Sale, these usually omit the £5 coin. 1987 saw the introduction of a British gold bullion coin, the Britannia. Following twenty years after the "invention" of the krugerrand, it was issued in convenient one ounce, half ounce, quarter ounce, and tenth ounce versions. Unlike the krugerrand, it features a beautiful design. We have more information about Britannias on our "Britannias Information" page, offer uncirculated gold bullion grade Britannias for sale on our "Britannias For Sale" page. Proof sets of gold Britannias have also been issued each year. As Britannias are not part of the mainstream British coinage system, we have listed these separately on our Britannia Proof Sets page. The Royal Mint occasionally issues gold sets which are a mixture of different types of gold coin. One example is a half sovereign combined with a tenth Britannia. We don't end to get many of this type of set, as they are often bought as gift items rather by collectors, and the issue quantities, as sets, are often quite low. Our prices for this type of set are usually under the original issue price. We have created a separate page for them, please see our Mixed Coin Gold Sets page.